Retractable roofs have been architects’ idée fixe for decades. Moshe Safdie once wrote up an idea for entire neighborhoods shielded by such roofs during the harsh season and open to the elements when it’s nice outside. The path to these dreams’ realization has been fraught with difficulties , from budget overruns to full-blown engineering disasters like Montreal’s Olympic Stadium (after a decade’s worth of efforts to fix it, the city finally gave up and installed a fixed roof in its place. It won’t be moving any time soon). Nevertheless, projects like that pop up again and again. And so do the difficulties. 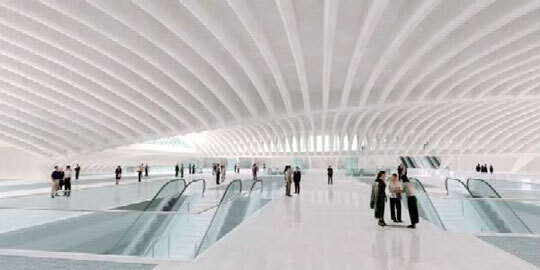 The latest example is Santiago Calatrava’s project for the Lower Manhattan Transportation Hub. Among the project’s many innovative features was a retractable roof. But will there be one in the final implementation? Very unlikely. But let’s start from the beginning. 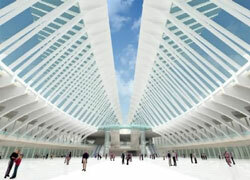 Santiago Calatrava is one of the world’s top architects and it is not surprising that he was tapped to design the transit hub at the World Trade Center site in New York. When his design for the Port Authority Trans-Hudson (PATH) terminal was announced in 2004 , it was, to quote NY Magazine , pretty much “the only part [of the project] almost everybody loved”. Calatrava’s plans for the $2 billion project call for an open-air design to link the ferries, trains, commuter trains, and subway lines that converge at the World Trade Center site. Natural light will stream onto the transportation platforms 60 feet below ground. Impressive. But that was 2004. Now, let’s fast forward to 2008. The NY/NJ Port Authority is struggling to keep the soaring costs of the project under $2.5 billion (some estimate the real cost of the project could now reach $3.4 billion). And it looks that increasingly that means making cuts. Drastic ones. Despite the repeated assurances from Port Authority (most recently in April) that the retractable roof feature is non-negotiable, it now looks like they’re ready to nix it from the plan, permanently fixing the roof in a half-open state. Speaking at a breakfast meeting of the Downtown Alliance Downtown Lower Manhattan Association, [Port Authority’s Executive Director,] Mr. Ward presented the [candid and transparent] assessment, which for the first time identified and detailed the key roadblocks to moving the project forward faster and more cost effectively. 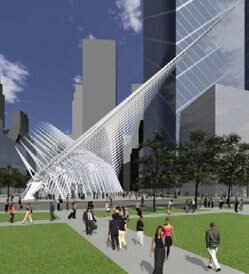 In fact, Mr. Ward took the occasion to announce that the first major site issue has been resolved, telling the group that the wings of the Santiago Calatrava-designed World Trade Center Transportation Hub will not open and close - an issue that has been contemplated for over a year but not acted upon. Mr. Ward said the Port Authority and Mr. Calatrava agreed on the design change to save time and money while still preserving the overall iconic nature of Mr. Calatrava’s winged design. The decision will allow the Hub to fit more easily within the overall site and not impose on the other structures including the office towers as the wings opened and expanded. While the architect has been trying to put a brave face on it (one NYTimes article quoted Calatrava as saying that the revision is simply “the latest example of many changes we have recommended” to save time and money “while preserving the integrity of the original design.”), it is clear that without the kinetic feature the project may not be as groundbreaking as it was slated to be. And the rumor is, things can get tougher still - some guess that many of the interior features that had to do with getting natural light inside the building may be revised (down) as well. We’ll be sure follow the developments.